Nantucket scallops are a special delicacy for those who get the chance to enjoy them. They are known for their sweetness that has hints of the sea in its taste. 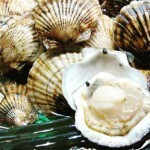 They have been hailed as the tastiest scallops in the entire world, as well as the black truffle of the seafood world. They are unique to Nantucket and as that is the case, they must be fully appreciated. Luckily for anyone in Nantucket in October, you and anyone else, can participate in family scalloping. November 1st marks the beginning of the commercial season for the harvest, sale, and purchase of scallops in Nantucket. This season continues on through the end of March. Generally, the commercial scalloping season starts a month earlier for other towns and islands who harvest northern bay scallops in the area, but in Nantucket this is not the case. Nantucket does this to honor the tradition of family scalloping by non-commercial residents during the month of October. So what is family scalloping? It’s a unique to Nantucket tradition. First, you must obtain a recreational shellfish license from the Town. You’ll also need the proper equipment, which you can get from places such as Brant Point Marine at 32 Washington Street. There, purchase wader or a wet suit, push rakes, an inner tube and a bushel basket, plastic or wire, waterproof gloves (if your hands are sensitive), and an opening knife if you plan on opening them yourself. There are some rules to recreational scalloping in order for anyone who wants to participate to have a good time. When you’re scalloping, you can only take ones that have a raised, well-defined growth ring on their shell or are .5 inches in height from the bottom of the shell to the top. You cannot take small scallops, as they’re still growing for next year’s season. Wardens will be out and checking if your catch is fair. Another rule is that you can only have one bushel per license per week. Scalloping is only permitted Wednesday to Sunday as well.